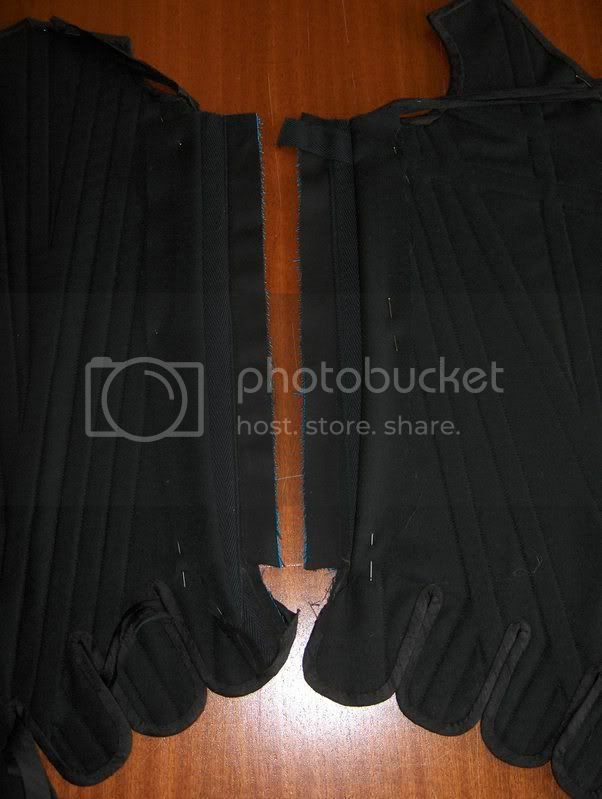 Your community for hints, tips, and general corsetmaking discussion. Tab binding tip #1 - do everything backwards! Here's the almost-finished binding... almost finished because I've done things in an unusual order. When you make a jacket, you mess with making pockets before you put the jacket together, right? Because it's easier to do the fiddly bits when you can do them on one smaller piece only, without having to wrestle the whole garment into submission. So tip number one for binding stays is: bind 'em, then put 'em together, and then complete the binding over the joins. 1. Take out the two bones at the side seams. You'll notice I didn't stitch through all the layers on these bones, so now I can pull back the top fashion fabric layer and sew the lining/coutil inner part together with linings together. 2. 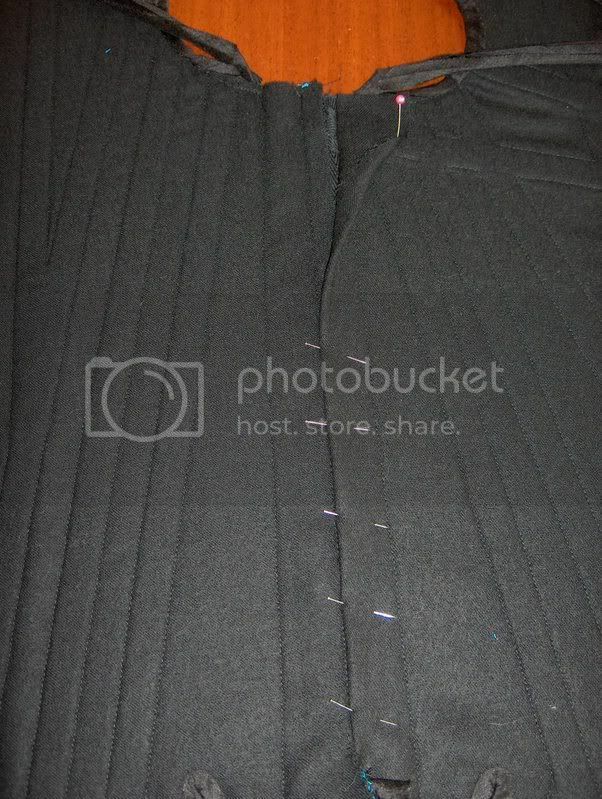 After pressing that seam open and grading it, the back fashion fabric is laid over the top and pinned down. 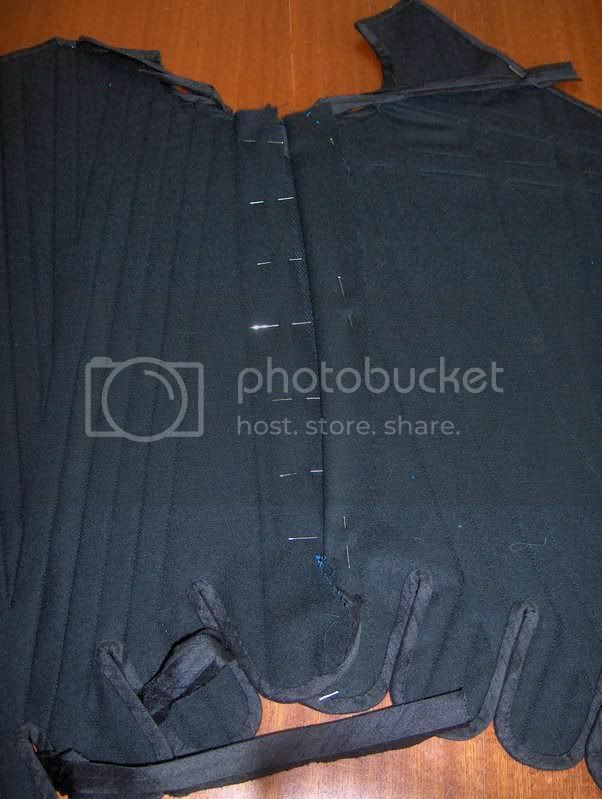 Then I can turn it over and sew down the ditch made by the side seam. 3. Having made a line of stitching on the top, now I can fold the edge of the front section back and pin down along the stitching line. 4. Finally, the edge is slipstitched down by hand. So now I have to bind over the joins, finish the straps (which will be totally detachable) and we're done! Above, the outside in black wool; below, the inside in Chinese blue cotton. Yes, brass eyelets. My client isn't willing to wait for a lottery win before she can order a pair of period-correct stays with handstitched lacing holes. Hey, if she's feeling ambitious later, she can cover the eyelets with embroidery thread on her own time. That's not too difficult. The period stays I've been able to examine have been made by completely finishing each piece, including binding, then whipstitching them together. Really? Wonderful, thank you, that's very satisfying to know! "The period stays I've been able to examine have been made by completely finishing each piece, including binding, then whipstitching them together." Oh, sure, NOW you tell us that! ;) This sounds like a much easier solution to binding...I think I'm going to try it out on my next set of stays. It certainly worked for me! It's totally period to do stays this way, and quite a bit less difficult. I always worry however that the side seam will split open without extra reinforcement, particularly since I am very hard wearing on my corsets. I usually wind up doing the sandwich method on my side seams, and reinforcing the bottom edge with a patch of twill tape on the inside of the seam as well. But yup, binding is always a pain, regardless of the method. 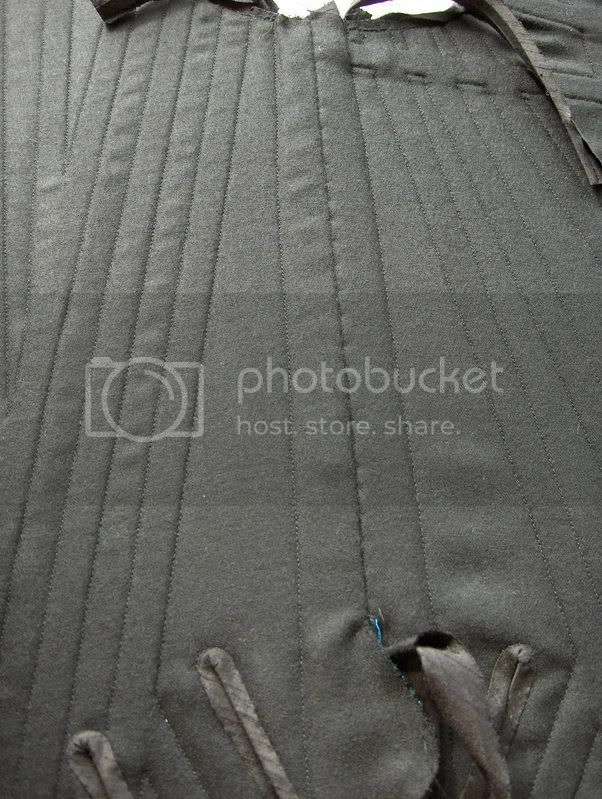 I'm not worried, I'm not doing this seam any differently from how I'd have done it in the opposite order, so it didn't occur to me to think of it as being any less sturdy. I think I'm often guilty of over-engineering anyway, so I try to hold back a little! :D Thank you very much! I think I must have a signature style. I don't know what it is, though... can't see the wood for the trees! Great isn't it? :) 18th century in-jokes. Gotta love it. Oh wow, I want a pair of bright blue stays now!